I drove my 340R with my wife at first time, after 2 years and 7 months! She didn't say worse at least. An open car is not new for her, because she was the owner of Mazda Roadster. That car taught me the joy of open car. My brother! Give it to me before selling it! I accelerated my 340R with sounds to a dog, of cause it's not near. But the dog was very surprised! It looked scared of another coming big animal! When I stop at the stopping line of crossing roads, the top bar of the front window avoids my watching signals. It's not important but it's on my mind very much! 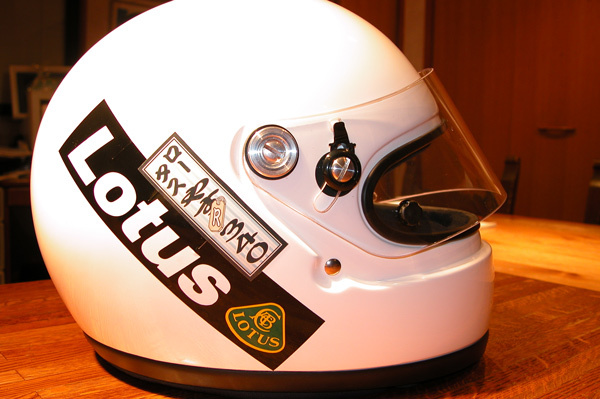 I bought a car helmet of Arai for driving a circuit. It's only for Lotus!